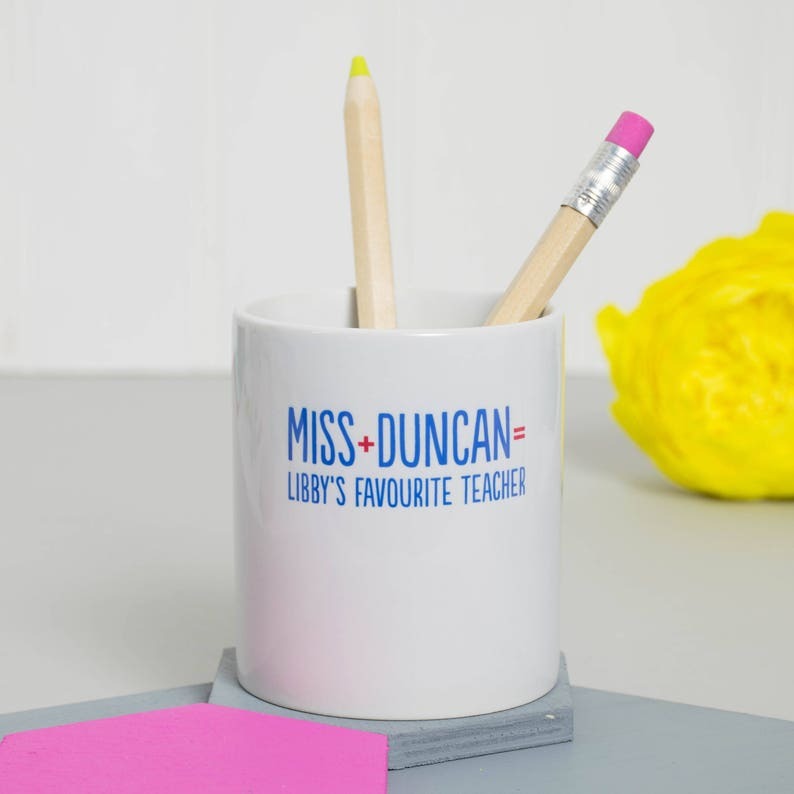 A lovely addition to your teacher's desk, this 'favourite teacher' desk tidy is a great way to remind them how awesome they are. Our stoneware pen pot is a lovely additon to the desk of teachers, and makes a great gift at Christmas or the end of term. We love helping our customers to thank the teachers, sports coaches and teaching assistants that make such a difference to children's lives and development. 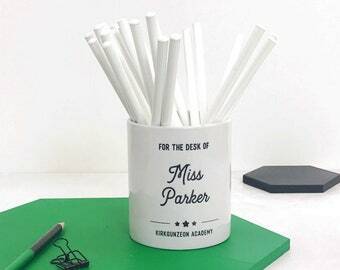 This desk tidy is practical and, of course, personalised with your choice of name(s) within our wording. 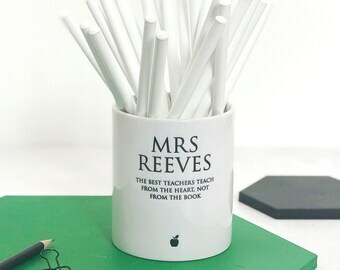 Teachers can keep the pen pot on their desk to remember that they're appreciated. Packaged carefully for safe delivery. Shipped on time. Just as pictured. We accept Paypal, Credit and Debit Cards and Etsy gift cards for all purchases. Please contact me if there is a problem with your order and I will do my best to resolve any issues. Personalised products can't be refunded unless faulty or damaged. Orders are typically sent within three working days, though this may be longer during busy periods. UK - allow up to 3 working days from dispatch. You will be emailed to advise when your order has been posted. Any customs charges incurred are the sole responsibility of the customer, and the onus is on the customer to check any relevant customs charges, tax or duty, which may be payable in their own country before placing an order. By placing an order you are agreeing to this Policy. For corporate or large orders, please contact me to discuss your requirements. Email me via hello [at] xoxostationery.co.uk or message me via Etsy. Please note all products and images are © xoxo stationery. Please do not use images with permission.